Thursday, August 17, I get vacation time, so everyday is as Sunday! It's 7:45 A.M. and the sky is clear, will be a good day to ride. The first stop is in Caravaggio (birthplace of the famous painter, Michelangelo). Monica waits for me outside on the sidewalk. We begin another trip with the "old lady", my faithful Moto Guzzi 1000 T3 California. (It's a 1000 because an SP1000 engine was installed). Our destination is Switzerland. But first, this afternoon we visit a couple of friends, then together, tomorrow we will ride to the ZENTRAL SCHWEIZER MOTO GUZZI TREFFEN. This is the second one of its kind, and a very small meeting. We attended this meeting (rally in America) last year too, and we enjoyed the friendly feeling so much we knew we wanted to come back. So I marked it on calendar. August is a good time of the year - because it's vacation time in Italy. So we'll go with an absolute relaxed feeling. Riding to the border is routine, nearly boring, we have no rush. We ride across the San Gotthard Pass. There's the San Gotthard tunnel. It's ten miles long, the smell of exhaust fumes is bad. It's also hot. Pure boredom. On the top of the pass we take a coffee break, and have a nice surprise. We meet Ralf, Iris, and their son, Philip, from Hokenheim, Germany. They are longtime friends of mine, and they are Guzzi riders too. But today they are in their car and on their way to Italy for vacation. We spend half an hour together, then on the road again. Now early evening we arrive at John and Marina's house, only four or five miles from Neuchatel. Marina is waiting for us to arrive. About an half hour later John comes home from work. Feels good to relax after a nice supper, a typical Swiss Raclette. The Guzzi meeting is just 100 miles from here. Unfortunately the next morning a rumble wakes us! The wonderful weather from the day before has turned bad and now there's a hard rain. The weather forecast on TV says already in Zurich, and Luzern the sun is shining, and around midday it will be sunny here at Neuchatel too. Confronted by this news, we decide to wait for the sun by visiting the city. Neuchatel is an old city by the lake, with lots of history. To walk downtown (close to the traffic) is a pleasure. Finally, the weather prediction turns out to be true. So we leave early afternoon all together to ride to the meeting. 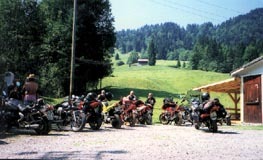 John says that we will ride through the nice Emmental Valley. It's a surprise to see this country. It looks like a picture post card. The road climbs a few miles through small villages. Then we leave the main road, to a smaller road, with cows walking everywhere without fear. Finally we come to the meeting. The small ford to cross to arrive at the meeting is dry. Last year when we arrived here, we found a torrent across the road. I ride a California, not a Quota! Anyway we are here. Officially it starts at 5:00 P.M. but enough people have already arrived. Many are friends, from Germany: Bodo, Petra, Rehinard, and Manfred. Only the week end before we meet at the Kupferpaste Guzzi Club rally in Collenberg. 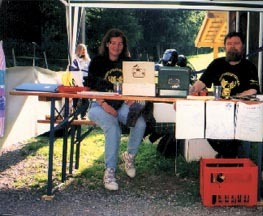 I see at the registration desk two old acquaintances of mine: Richard and Rosmarie, and from Italy Palla and Franco. Walter is an Italian friend that lives in Zurich, Germany and lots of Austrian friends are here too. 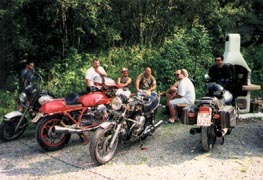 This meeting was born from the desire of three Guzzi enthusiasts: Pascal, Edy and Joseph, all members of the European Division Moto Guzzi Club. With the help of some local friends they have organized this event. The meeting is located in a very nice place, very close to the Glaubenberg Pass in a wooded area along side the mountains. Cows are grazing, and on other side of a river, a big hut has eats and drinks. There's a grill where we have wùrstel or steaks, all very essential. The rest of the afternoon passes in the usual way of watching the bikes and talking among friends, and offering to everyone a draught of self distilled Grappa. Palla always likes to have some in a situation like this. One lucky guy is Stefano, a friend that lives in the Como Lake area. He's back after vacationing in northern Europe. His arrival is a nice surprise for us. The evening passes in good time, local bikers come to talk, so there is a good feeling, and I don't realize that hours are passing by. Saturday morning, the noise of lots of cow bells, says to us "wake up!" It's a wonderful day and we decide to ride down in the valley, without any target in mind, without rush, just for fun to enjoy the panorama. 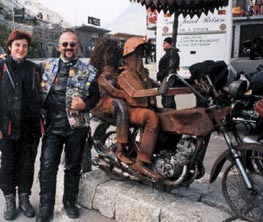 When we come back during the afternoon, we meet other Guzzi riders on the road that take a touristic tour around the area. Meanwhile, people are still arriving. More friends come, and I see friends from Italy: Ruggero, Cesare Galvanone, and a young Guzzi dealer. Unfortunately he only stays just a few hours, then back again he goes. He wanted to be at home by evening and defend the fort. That is to say, his wife and parents are on vacation, so no one is at home, which is the same building where the shop is located. We see a German SP1000 with the sticker from his shop, but we don't find the owner to ask him where he bought this bike. The weather is great, lots of sunshine, and we act like lazy cats and loaf about. Surprisingly, I discover a biker that I think is Swiss from Luzern, who has put his roots just 35 miles from my town. In good enough Italian he tells me that his family is originally from Lago d'Iseo. Stefano meets again a German guy he met some years before at a rally. In those days they had a lot of good times, but Stefano never saw him again, but now both are here! Small world. As it turns out we learn that a band leader from the USA will be there so we're anxious to listen to them. Last year, there were about 60 people in attendance, but this time a lot more are here and as the evening time comes, more are showing up. Walter translates in Italian what Joseph said in German; that he really appreciates us, and in particular thanks the Italians. We enjoy hearing his friendly words. Now the band starts to play a good mix of rock and roll and country rock. The room is not big, but it is possible to dance. During a break I talk with Palla about our trip back. I don't want to ride on motorway toward Luzern, so I think I'll join Palla and Franco, and ride on the mountain roads to cross the Italian border at the Lago Maggiore area. We stay until late in the night to listen to music, talk, and drink, and then the end comes, and finally we say, "Good night guys." Sunday morning it is again a sunny day. We get breakfast together. There are a lot of sleepy faces, no desire to ride back again so early, but we give last farewells, and we see you again in two weeks in Germany, at the Moto Guzzi Club Friedrichhafen meeting. Our group starts the back home trip in the direction of the Glaubenberg Pass. This is a very funny tortuous road with lots of cows on the road and a lot of cow droppings on the pavement. Watch out! This is dangerous for the two wheels! We ride without rush. Through the valleys and through a small town. There are an incredible multitude of bikers on a tour in this place. Finally we come to the Grimsell Pass, 2165 high. Unfortunately the top is covered, and a really chilly wind cuts the face. We take a rest at a café where bikers are "welcome". There's even a parking area for bikes. There are rat bikes here today. They are painted in one different color with painted engine and even the tires are painted. One in purple, one in fluo-green, an a Aprilia in dark blue. In spite of the chilly wind we stay on the terrace to drink our coffee and watch bikers as they come from two sides of the pass. This is great! Once again on the road. Down in the valley we enjoy the sun, the important city of Brig, then up again towards the direction of Passo del Sempione. This is another interesting road. It's late afternoon, but still good light, just before we reach the Italian border. We stop to gas up with the cheaper Swiss gasoline and then greetings as we cross the Italian border. In a couple of hours we are home again, tired but happy. The mind is already ready for the next meeting in just two weeks, and we'll be "On the road again!" what more could we ask for!? Saluti bicilindrici from Italia, ciao Luigi, 1000 T3 Cali.